I have a Nordic/Norwegian keyboard. I'm sitting on an iMac with Mountain Lion and are remoting to a Windows 7 computer with Remote Desktop Connection. I can't find the < or > shortcut (pressing < gives a different character (pipe)). Does anyone know? I am aware of this question and know how to find most other characters, having tried numerous combinations, but not the < sign. I also know I can get the character palette, but that is just too slow when I need it relatively often. Edit: I do not have a numerical pad on the keyboard. 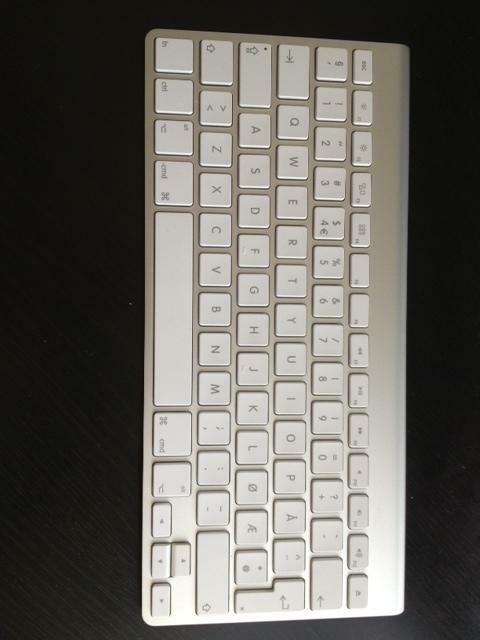 This is the smallest version of the Nordic Mac keyboard and is the default delivered with an iMac in Norway. Edit 3: Thanks to @koivo I learned that < is called an angle bracket. I did some googling and found only one unanswered question asked at a different forum (ars technica). I have also tried all sorts of key combinations, but no luck so far. Edit 4: I have now learned that using CoRD (which is slightly buggy and discontinued in development) or Royal TS (which cost money) will give me angle brackets (<) on the angle bracket key itself. However, I have added a bounty to see if it is possible to do with Remote Desktop Connection that comes with the iMac out of the box. Edit 5: This is written after the correct answer and bounty has been awarded. Even though a shortcut is available, using the free version of Royal TSX is just a simpler solution, as stated in one of the answers! Try going to System Preferences:Language & Text:Input Sources. Enable and display the keyboard viewer to get a better view of the next steps. The first step to try is to turn on the U.S. keyboard. This should cause shift+comma and shift+period to yield the desired characters, < and >, in place of ; and :. You can switch between keyboard layouts either using the flag menu that will appear on the right of your menu bar, or by setting keyboard shortcuts. If switching to the U.S. keyboard layout doesn't work, enable Unicode Hex Input to allow the entry of any Unicode characters by holding down option and typing the hex code point. <alt/option>003c yields < (LESS-THAN SIGN) and <alt/option>003e yields > (GREATER-THAN SIGN). See http://www.unicode.org/charts/PDF/U0000.pdf for a table of common ASCII based Unicode characters. LESS-THAN SIGN and GREATER-THAN SIGN are the official Unicode names for the angle brackets. For what it's worth, when I turn on, for example, a Swedish keyboard on my U.S. system, the key to the left of the number 1 offers < and >, as opposed to what I see in your picture. Showing the keyboard viewer should help clarify what to expect. Perhaps you could set up another keystroke to produce @ via system preferences/language & text/text/symbol and text substitution. Microsoft Remote Desktop Connection is not supported on anything newer than Snow Leopard 10.6 and if you use it long enough on newer versions of OS X you'll probably run into other issues besides this one such as random crashes from my own personal experience. Royal TSX is indeed free (with limitations) and has a plugin using FreeRDP under the hood which supports newer versions of RDP configured to require NLA (Windows 7+, Server 2008R2+). My suggestion is that you re-evaluate your decision to stick with RDC, it's a dead end unless Microsoft decides to update it and it's not looking as if they will. You cannot have more than 10 connections per Royal TSX application instance. You cannot have more than 10 credentials per Royal TSX application instance. You can open only one Royal TSX document per application instance. AppleScript access is disabled. Also note that all the features of Royal TSX can be used without a license key. No other restrictions apply. To remove the above restrictions, it's required to obtain and enter a license key in Royal TSX. How can I type a § in a Microsoft Remote Desktop Connection window? How can I type “\” (backslash) via remote desktop with a Norwegian, Danish or Swedish keyboard? How can I type the “@” symbol via VNC with a PC keyboard?